This bank is one of just a few souvenir building replicas with the distinction of being reproduced by two different companies. 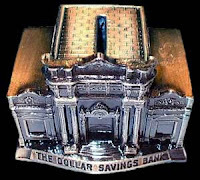 Both A.C. Rehberger and Banthrico produced coin bank replicas of the Dollar Savings Bank. They look very similar, but until you pick them both up and compare them side by side do you notice the differences. The A.C. Rehberger version has much finer detail and it has the slot (for coins) and the hole (for bills) on top. Also a bit heavier, the Reheberger has raised letters, whereas the Banthrico version’s letters are recessed. Rehberger version’s top reads, “This is your bank,” while the Banthrico has no words on its top. Along both bases is written: “The Dollar Savings Bank. Pittsburgh, PA. Organized in 1855. 330-344 Fourth Avenu e.” On one side is: “The only mutual savings bank in Pittsburgh.and the other side reads: “A safe place for your savings.” Of course, the easiest way to tell the difference is the makers make and trap on the bottom. 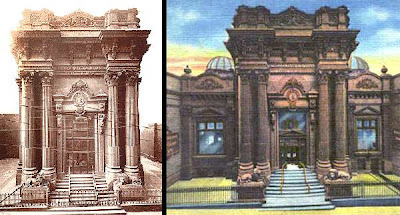 Architect Isaac H. Hobbes designed the real Dollar Savings Bank building which opened in March, 1871. This Connecticut brownstone hall housed the first mutual bank in Pittsburgh. Its most striking features are the Baroque facade composition of colossal Composite columns and Max Kohler's docile, life-sized lions at the front steps. The Dollar Bank building on Fourth Avenue is one of the very few original buildings in Pittsburgh's old financial district that's still used as a bank and it is now on the National Register of Historic Places. The Bank’s Trustees meant the new structure to last and to stand for something. They placed the stone lions at its gates as symbols of guardianship of the people's money. They thought of the lofty columns as bespeaking the institution's high aims. They began talking about the design it in 1860; and, before they were through, few business structures had received so much thought. Ah, those were the days when banks demonstrated their longevity and strength through sold columns and stable, long-lasting architecture. These days, financial institutions seem more interested in making a quick buck through risky schemes. Where does ascertain the value of the Rehberger replica? I obtained one this morning at a yard sale and it looks like new. Hi John, If it says Reberger on the bottom, then this is an antique bank. They have not been made in many years.